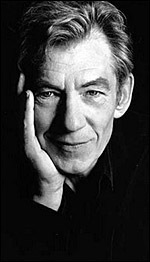 Cambridge-educated Ian McKellen first appeared on stage at the Belgrade, Coventry, in 1961 and has since built up a formidable reputation in plays classical (memorable Richard II and Edward II in 1970; Hamlet in 1971) and modern, working with the National Theatre , the RSC , in provincial theatres and on Broadway. His film debut was in The Promise (d. Michael Hayes, 1968) followed by Alfred the Great (d. Clive Donner, 1969) and A Touch of Love (d. Waris Hussein, 1969). Busy on stage and TV (e.g., Ross , 1971) during the 1970s, he returned to film as D.H. Lawrence in Priest of Love (d. Christopher Miles, 1981 - longer version, 1985), and played John Profumo in Scandal (d. Michael Caton-Jones, 1988). He created one of British screen's most compelling villains in his performance of the tyrannical King in Richard III (UK/US, d. Richard Loncraine, 1995). Outspokenly gay himself, he came to international attention in his Oscar-nominated roles as gay director James Whale in Gods and Monsters (US, d. Bill Condon, 1998) and Gandalf in Lord of the Rings (US/NZ, d. Peter Jackson, 2001). In the 1990s, he has consciously expanded his film career and is in demand on both sides of the Atlantic. He was knighted in 1991.